Desperate for something new to read? 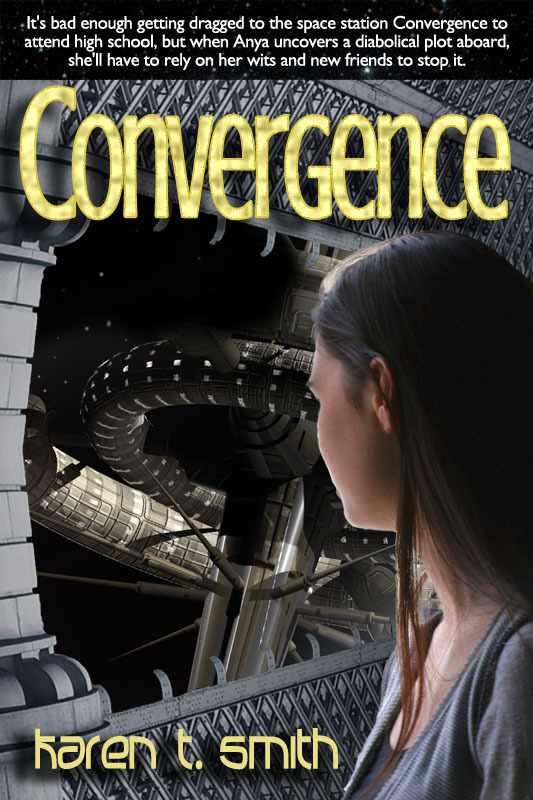 My young adult (young end of YA, perfectly appropriate for most middle-grade readers) science fiction novel CONVERGENCE by Karen T. Smith is now available on all ebook platforms (amazon kindle, barnes and noble nook, smashwords for most other e-readers. Note: Kobo and Sony Reader distribution should be within the next 1-2 weeks. Apple mail trail a bit longer.) Paperback available at most e-retailers and Createspace.com. First of all, isn’t the cover gorgeous? I had a fantastic cover model (one of the kids’ babysitters!) and my really awesome friend Renee of The Cover Counts worked on this cover with me. We found some fantastic images, tweaked the heck out of them, and spent god knows how long talking about fonts. Did you know there are literally thousands upon thousands of fonts out there? Absolutely crazy! I’m beyond thrilled with how it came out, though. It’s pretty much as close to how the whole space station setup is pictured in my head barring an actual artist’s rendering. Space Station, high school, some really terrible hair days, diabolical plot. Things just go from bad to worse for Anya. It’s bad enough getting dragged to the space station Convergence to attend high school, but when Anya uncovers a diabolical plot aboard, she’ll have to rely on her wits and new friends to stop it. Anya is pissed when her family moves from earth to the Space Station Convergence. Everything is strange from the food (soy paste in all its colors and forms) to the frequently changing gravity conditions at her new high school. Anya soon uncovers a plot to take over the central computer’s core processor. While this might not bother your typical geek, Anya is anything but your typical geek. She has discovered that the central computer is self-aware, and that computer is Anya’s first friend on the Convergence. Anya will do anything to protect her computer friend, Isis, even if it means breaking into Central Computing and telling her other new (human) friends about Isis. But don’t just take my word for it, read it for yourself and let me know what you think! Reviews as always are GREATLY appreciated!